Hong Kong — Hong Kong flagship carrier Cathay Pacific said on Wednesday net profit more than tripled last year thanks to a rise in demand from Chinese travellers and fuel cost-saving measures. The airline said profit jumped to HK$2.62 billion ($338 million) from HK$862 million in 2012 as revenue climbed 1.1 percent to HK$100.5 billion. The 204 percent increase helped the firm recover from a painful 2012, when its bottom line was hammered by the effects of the eurozone crisis as well as persistently high fuel prices. The result was in line with the average HK$2.74 billion net profit forecast by analysts, according to Dow Jones newswires. However the figure is still well down from the HK$5.5 billion profit seen in 2011. "The operating environment remained challenging throughout 2013... It was therefore encouraging to see an improvement in our overall performance," company chairman Christopher Pratt said in a filing to the Hong Kong Stock Exchange. Cathay, which also owns Hong Kong-based airline DragonAir, said it transported almost 30 million passengers in 2013, an increase of 3.3 percent from the previous year, helped by strong demand for leisure travel from its base in Hong Kong, a jump in outbound travel from mainland China and promotional ticket programmes. Fuel remains the most significant cost, the company said, accounting for 39.0 percent of total operating costs in 2013. The airline said it had helped combat high fuel prices by withdrawing older planes and operating more long-haul services using fuel-efficient Boeing 777-300ER aircraft. The company also reshuffled schedules, helping bring down fuel costs by 4.6 percent year-on-year, it said. Pratt said its cargo business had been hit by weak demand since April 2011, with revenue falling 3.6 percent to HK$23.7 billion. But the company said it remained confident in the city as an aviation hub. An investment of HK$5.9 billion into a new cargo terminal at Hong Kong airport, which opened last year, "will bear fruit in the long term", it said. The airline has also faced stiff competition from low-cost carriers, particularly in Southeast Asia. 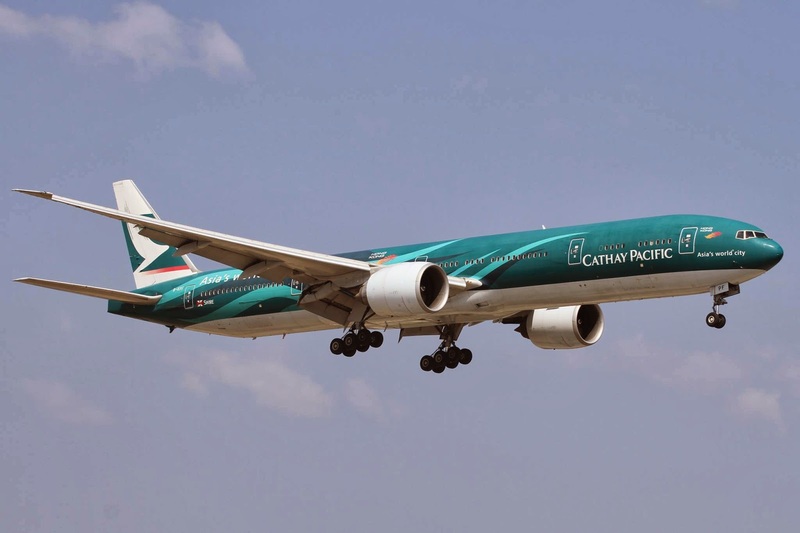 In 2013, Cathay Pacific acquired 19 new aircraft, including five Airbus A330-300 aircraft nine Boeing 777-300ER aircraft and five Boeing 747-8F freighters. Cathay was trading down 1.8 percent at HK$15.5 early afternoon Wednesday in Hong Kong.